Benign lesions of the liver are relatively, rare compared to primary and metastatic hepatic tumors. They present a challenge not only in their initial diagnosis, but also in the selection of proper treatment. Since they usually are slow growing and, in several instances, actually congenital, routine liver function tests seldom suggest the need for further investigation. 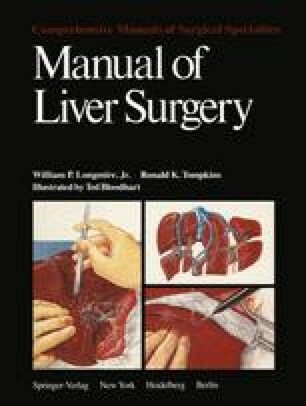 Only when they reach sufficient size to be palpated or to obstruct the biliary ducts or adjacent organs are they discovered preoperatively (Fig. 6.1). The symptoms produced by these larger benign tumors may be related to stretching of Glisson’s capsule or pressure on adjacent viscera or the parietal peritoneum. For example, recently a tumor was found when obstruction of the gastric outlet produced vomiting. More frequently the presenting complaint is obstruction of the biliary tree by these tumors. Symptoms often mimic acute or chronic cholecystitis. An additional presentation, not at all uncommon, is the sudden onset of pain and rapid increase in size associated with hemorrhage into, or from, pre-existing tumors. Thrombosis and infarction of vascular tumors, such as hemangiomas, also produce rapid onset of symptoms.